Today I made a new friend, his name is John, and to the average person he is just another tramp who’s made the wrong choices in life. Someone who only has themselves to blame, someone who doesn’t have emotions and someone who more than likely spends the money they’ve begged and scrounged for on drink or drugs. The person who you turn away from and pretend you never saw. Today I learned there is a bit more about this man; he was once a regular guy like you or I. He had a house, a partner and a young girl. Unfortunately for John and his family however, his daughter had Cystic Fibrosis and she sadly passed away. The passing of his daughter understandably had a huge impact on their lives and as a result John found it very difficult to come to terms with this and the relationship broke down. Eventually John lost his business and ended up on the streets. I spoke and enjoyed a nice hot cuppa with John, he was telling me that he when he gets back on his feet, he wants to do a psychology course and be able to help others in the future. Especially children who are vulnerable or homeless. Throughout our chat, it was remarkable to see how someone who has gone through what he has could also be so positive. The point of this post isn’t to be self-righteous, it’s to make people think. Think of others, who are YOU to judge anybody? The next time you see somebody homeless, do not turn away from them. Take the time to speak to them. Buy them some lunch. Take the time out to acknowledge them. You never know, it may well be you in the future. 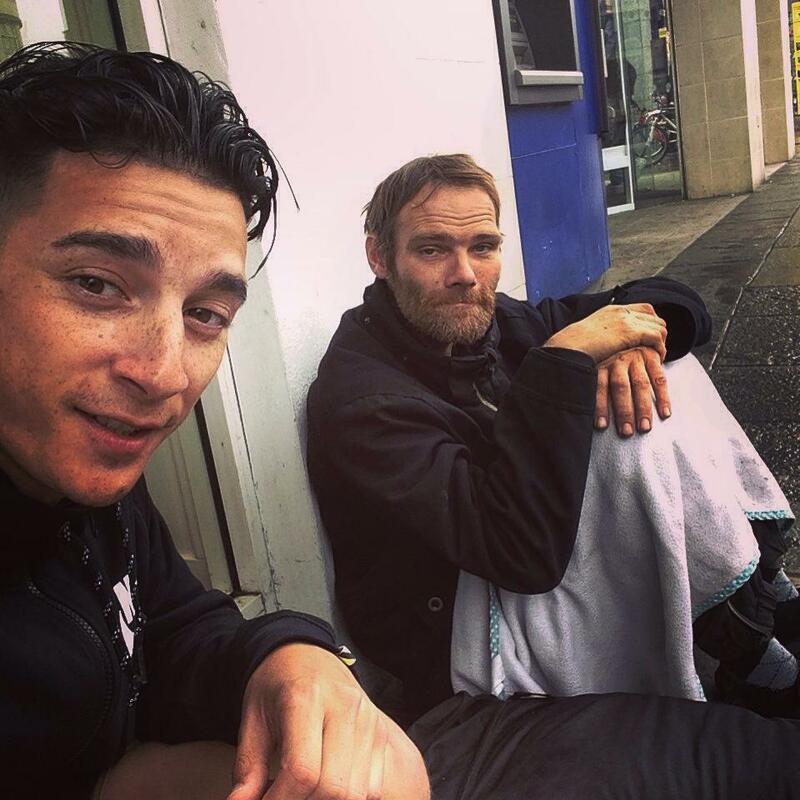 Not every person on the streets is so because they liked drink or drugs too much and not everyone on the streets wishes to remain there. I want as many people as possible to share this post, again, not to be seen as some sort of saviour to the homeless but to hopefully make people think differently. In all aspects of life. Beautiful. Everyone has a story. So true. Most will look the other way. Homeless people notably look kind of disheveled and this is upsetting to those of us who have the “comforts” of our homes. Thank you, thank you. We are not here to judge, but to love and nourish each other. You are right–we just do not know a person’s circumstance or how they got there–just as no one knows ours. I appreciate such reminders as these; they make a huge difference. I can see how lucky I am and know how easy it would be to slide. Thank you for sharing your experience. There are a lot of people like John in every vicinity. They are not where they are in life by choice. No one grew up planning their future to be homeless, and hanging out on the street depending on the generosity of passerby. Impactful post. I read this morning where a woman who had been sheltered two years ago to avoid being outside when homeless, just donated $12,000 to the shelter now that she is back on her feet. A teenager of one of our homeless clients volunteered after school at a food bank without her parent’s knowledge. These are just a few examples of homeless people like John. There but by the grace of God go I.
It’s a nice post, but in spite of the fact that it tells us not to judge, it feels a lot like you’re judging people who are on the streets because of drink or drugs as not worthy. If we have one of those conversations and find out drinking or drugs are involved are you saying we should then walk away? That that one fact takes away their humanity and makes them unworthy of compassion? Did you mean to include that piece that separates the drinking/drugs group from the “worthy” group? Or do you really suggest that we not judge? Which means we don’t get to judge anything about anyone. Be a Friend Today ….